Just as there are growing seasons on land, there are growing seasons in the ocean. The productive ecosystem off the coast of California has three oceanographic seasons. Just as spring and summer are growing seasons in our backyard gardens, there are growing seasons in the water column around Cordell Bank. During springtime, strong northwest winds push the water southward along the California coast. 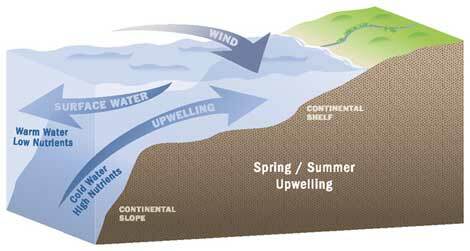 Gale winds and ocean currents, combined with Earth's rotation, drive surface waters away from the shore. 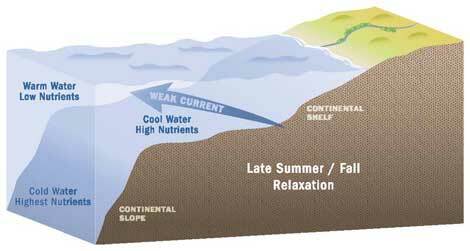 These surface waters are replaced by upwelling of deeper and colder nutrient-rich waters from offshore. The nutrients become available for surface dwelling phytoplankton, or marine algae. Phytoplankton are the foundation of the food web and the infusion of nutrients and increased sunlight in spring initiates a bloom of life that radiates up the food web. An abundance of phytoplankton, zooplankton, and young fish are food for animals at higher levels of the marine food web. During the late summer and fall, coastal winds die down and the sea surface becomes calmer, a good time to visit Cordell Bank National Marine Sanctuary! The northward-flowing Davidson Current moves over the Continental Shelf bringing warm nutrient poor waters from the south. The winter storm season (mid-November through early spring) is dominated by rough seas and mixing of deeper ocean water. The water on top of the continental shelf becomes mixed between the seafloor and the surface. The temperature, salinity, and concentration of nutrients are more similar throughout the water column.